Carnival Cruise Line has launched a new print advertising campaign developed in collaboration with SapientRazorfish aimed at travel trade publications serving the travel agent community. The ads emphasize what makes travel advisors special — the transformative guest experiences at sea that can only be delivered by travel advisors who know both their client and the Carnival product. The campaign blends the brand’s “Choose Fun” and “Travel Agents Rock” themes while highlighting Carnival’s latest product features. The ad campaign supports a wave of new Carnival product news coming in 2019, including the line’s epic West Coast expansion and Carnival Panorama updates, previews of Mardi Gras, new Europe itineraries and more. 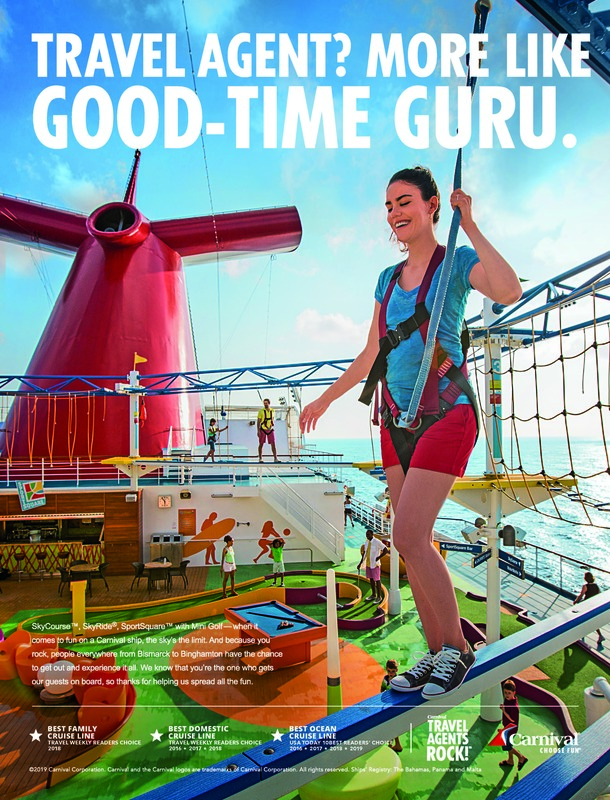 For the first time, the print ads from the campaign will be available to travel advisors to download from Carnival’s marketing library on GoCCL.com to share on their website, display in their office and post on social media platforms. “We really want to expand the campaign beyond print publications so it can also be a tool for travel advisors to showcase and grow their business,” added Perez. For more information on Carnival’s trade print campaign or to download the ads, login to GoCCL.com and click on the Marketing Tools tab.